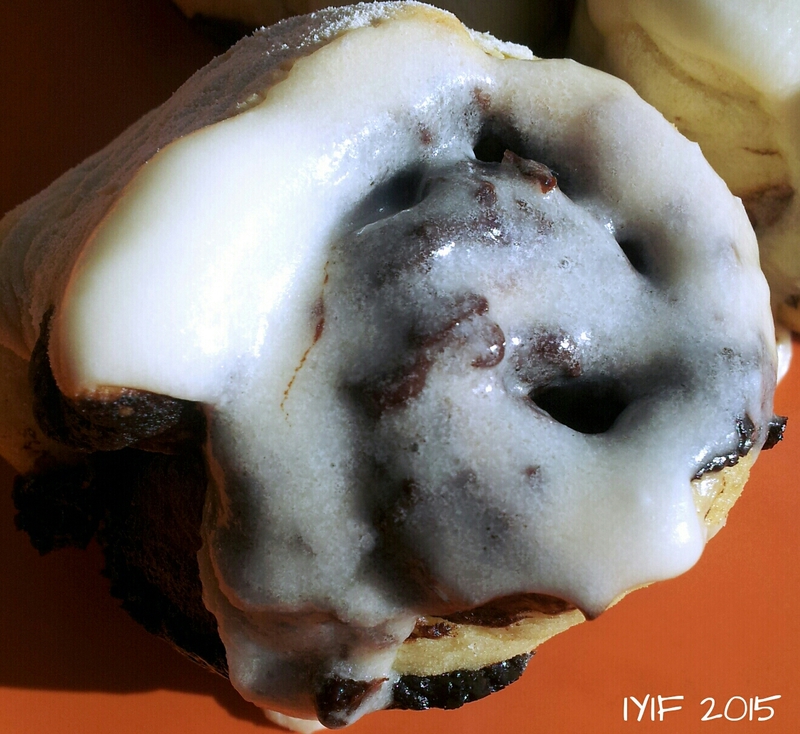 I was in the mood for something fudgy this weekend and bready, thank you stress, and decided to do a new take on my Fool Proof Cinnamon Roll recipe. 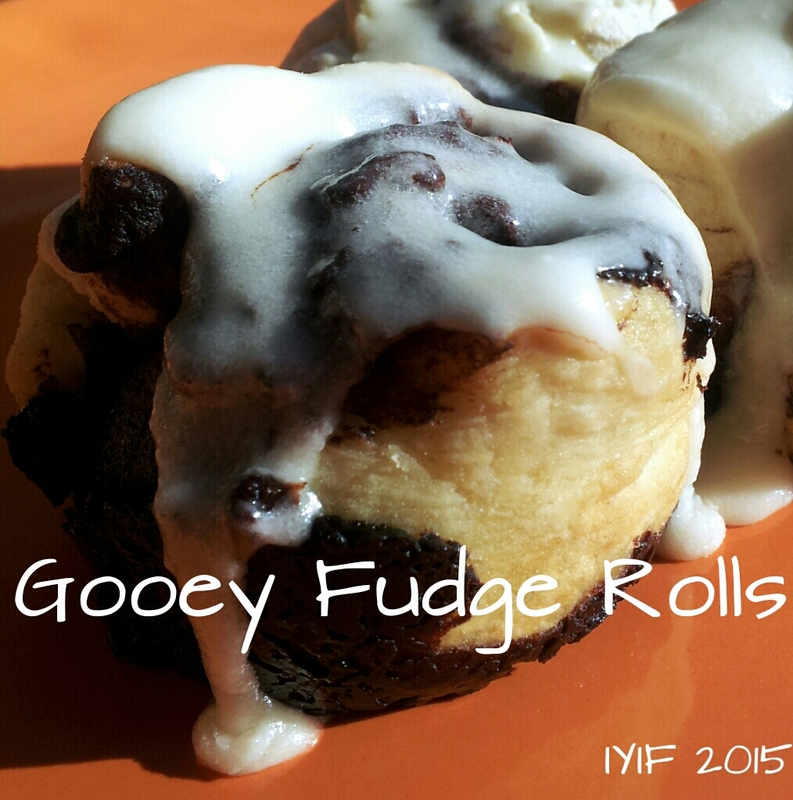 These little baked goods came out extra gooey, dripping with creamy sweetness, and fudge. Over all, a yummy sensation! The dough is exactly the same as the cinnamon rolls. It is a super easy sparkling water dough that allows you to skip the yeast. 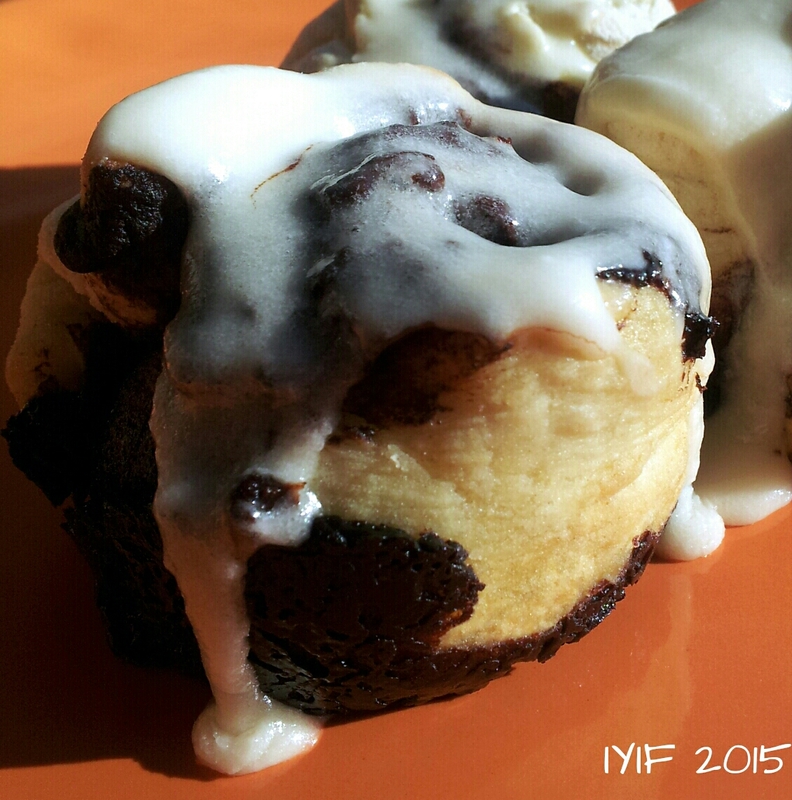 If you are thinking that you can’t get nice puffy rolls without yeast, you are wrong. These are absolutely beautiful! All that you need is all-purpose flour, baking powder, salt, sweetener (I used Truvia), and the all essential ingredient, sparkling water. I have a Soda Stream because I drink a lot of carbonated water, but you can just buy a bottle of store brand unflavored sparkling water at the store. I will remind you that the dough is pretty sticky when you first stir all the ingredients together, and because we are depending on the sparkling water, and baking powder, the quicker the dough gets worked and in the oven, the fluffier the rolls will turn out. The amount of extra flour on the working surface to work the dough depends on the stickiness of the dough. The dough can be flattened out as soon as enough flour is kneaded in to keep it from being sticky when it is spread out. (I used my hands instead of a rolling pin) If you keep working it, you can work it back into a sticky mess, and the more you work it, the tougher the dough will get. Approximately 1/8 – ¼ cup of extra flour can be needed. I found that if you flatten the dough out in a rectangle with your hands, flip it over, fold it in thirds, flatten it out again, and repeat the process two more times, before finally flattening it into a fat rectangle to spread the fudge on, it works the best, and you get the puffiest end results. Once the dough is spread out, and most of the stickiness is gone, you should be able to whip up your fudge filling and spread it on. (If you leave your butter on the counter while you are making the dough it will be soft enough to cream the butter, cocoa powder, and Truvia together quickly to keep the dough from losing its leavening.) There is a lot of filling in this recipe so don’t worry about having enough to spread to every edge and corner. (It will leak out a little during cooking, but that is part of the yummy gooiness!) Once the fudge is spread, roll from the long side, and using a sharp knife cut the dough into 3 rolls. Place them in muffin tins that have been lightly coated with nonstick cooking spray. (Make sure that the end pieces are short end up.) Gently flatten with your hand to spread the dough into the muffin tin, and then bake. After the rolls are baked remove them from the tins so that they can cool. After about 10 minutes you will be able to frost them. WARNING: If you frost them while they are still hot the frosting will melt and turn into a puddle. Nothing yummy or gooey about that! Once these bad boys are frosted sit back, relax, and enjoy! Combine flour, baking powder, Truvia, and salt in a bowl. Pour in sparkling water (It will foam a little) and stir with a spoon, it will be sticky! Dump out onto a floured surface and sprinkle a little flour on top of the dough. Gently knead, spread the dough out, with your fingers. Flip over, fold in thirds. Do this two more times before spreading into a fat rectangle. Once the dough is spread out whip together the filling of softened butter, Truvia, and cocoa powder. Spread generously across the dough, roll loosely from the long side. Cook for 15-20 minutes until the rolls are firm. Remember, they will not brown. 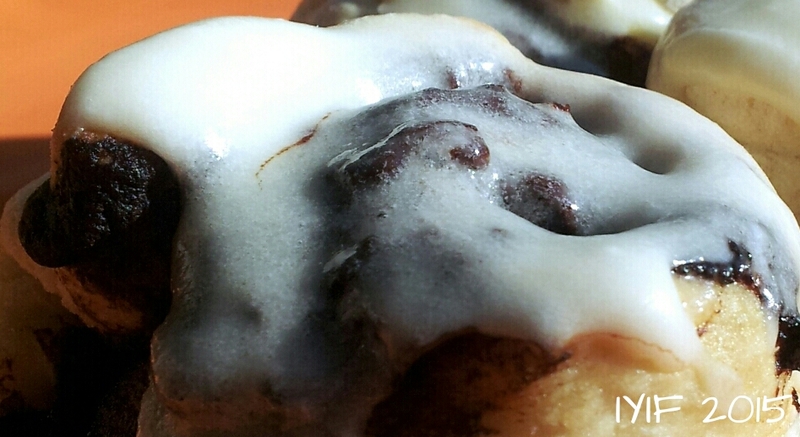 Remove the cinnamon rolls from the oven and after a few minutes transfer to a dish and let cool for about 10 minutes. While the rolls are still warm combine the powdered sugar and butter to make a frosting. Stir past the crumbly stage until it is creamy and spread over the top of the rolls. It will melt slightly creating a glaze. Serve, or enjoy by yourself!